Should I give my baby food before or after milk feeds? Many parents wonder about the right time of day to introduce solids to a baby, what is the best weaning schedule and how to fit food in with the milk feeds. Anna, our registered Nutritional Therapist, answers your weaning questions. 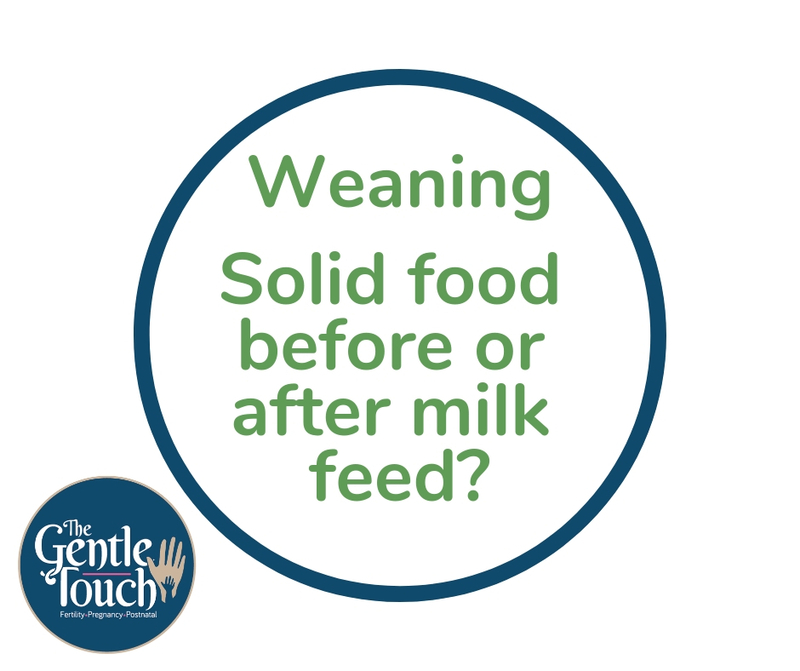 During the first few months of weaning your baby will still be relying on milk for their nutrients. The weaning schedule can be fairly relaxed. The initial elements of weaning are very much about playing with the food, testing and exploring texture, small and taste. This is such a fun adventure for little ones, and an exciting family milestone. We suggest giving your baby food in between milk feeds so your baby is not too full of milk, but not too hungry. During the first few weeks your baby will not know that food can fill them up so they may be frustrated looking at food. Think of the first few times offering food as an activity for your baby rather than a meal. Allow 45-60 mins after a feed to offer your baby solid food. We are not replacing any milk feeds at this time. By the time your baby is around 10 months they should be eating 3 meals a day with some snacks in between so there is plenty of time to ramp up to this weaning schedule. Don’t stress if you baby doesn’t take to food straight away, they will get there with patience. Start offering food in the morning or mid-afternoon in between feeds. It isn’t advisable to offer solids for the first time right before a big sleep (e.g. night time) in case there are any digestive upsets or any allergic reactions. If you have any questions about your baby’s weaning schedule or anything else about first foods you can join our Baby Nutrition & Weaning Facebook group to get Anna’s support with weaning. Weaning classes in Bristol – If you’re interested in a comprehensive overview of weaning including how to start, when to give foods, what first foods will support your baby, as well as an overview of allergies and specific nutrients your baby needs come to a class. We run regular Baby Nutrition & Weaning workshops around Bristol – book online.